This is Flapper's mummy, familiarly known to be THE bias mummy who loves Flapper most. I won't deny it. Flapper will always hold that very special place in my heart. You see, Dumbo is the king with the entire Choo family while Frodo just goofily barges his way into everyone else's heart - especially Grandpa (read Everybody Loves Frodo). Pebbles is the apple of daddy's eyes. So Flapper, despite being Mr Popular, is not that well-loved in his personal life. Flapper is just plain stoic which some consider boring. Unlike his highly-animated and attention-seeking brother, Flapper is chilled. Very chilled. He is, in human terms, at peace with himself. He will turn sideways and show the appreciation for belly rubs. He will just go relax at one corner on his own. Well... okay, until food is present. He will be the first to report attendance with a nice sit and that million dollar smile. Then there is my personal fascination with Flapper's brains. I fondly call him the 'Rocket Scientist'. Until today, I still get amazed by how he figures things out. I talk about Flapper's brains pretty often but I was never able to document it for 'evidence'. I get those dirty knowing looks like "yes, yes, we know how proud you are of Flapper" or even possibly, "stop exaggerating." So the other day, Nic and I decided to try that underwater thing with the boys again - him with his GoPro and Flapper (I cannot use 'I', the camera does belong to Flapper) with his Action Cam. We are not on any camera competition. We just like having fun with our own cameras, try new stuff with the boys and see what we can capture. Gorgeous photos by Uncle Nic using his GoPro. This was my third attempt trying to get the boys underwater. Three is a big number for Flapper. It is the number times he needs to either figure or master something. By this third attempt, Flapper had pretty much figured out that he needed to stick his head in the water to get the toy. We started out easy with him at the shallow end of the pool. But mind you, when it comes to swim and toy, Mr Rocket Scientist still has reflexes like a young dog. He would watch us throw the toy with much focus and grabbed it before it hit the bottom of the pool. So after a while, I realized that Flapper had figured something else out - How to use his paws to push the toy up (it's a slope) to the shallow end of the pool before retrieving it. Time to up the game. So Nic and I started throwing the toy just at the bottom of the slope for greater depth. Flapper would give me that "I cannot get it" face. That's a hoax I tell ya! He ALWAYS does that in the face of humans but when they turn their back.... go figure. After helping Flaps a few times, I told Nic, "We are going to ignore him and leave him be. When he gets desperate enough, he will try something. Let's just see what he will get up to." So we ignored Flaps and focused on all-brawn-no-brains Frodo who hopelessly kept splashing the toy right to the middle of the pool. We even made things VERY EASY by putting the toy at the shallowest end. It was as good as just picking the toy up. But nope, Frodo hilariously kept splashing the toy all the way to the middle of the pool with his brainless motor-charged paddling. After some time of ignore, Flaps started to figure it out. It was not easy initially due to the water depth but he persisted on and eventually got the toy up to the shallower end of the pool and retrieved it. As usual, I tried a few times to verify if it was a fluke. And of course, with each try, the duration taken to retrieve the toy became shorter and more effective. Nic and I whipped out our camera to see what images we could capture underwater. I got a surprise when I saw this footage we captured of Flapper and it really showed his thought process. I slow-mo-ed the footage to get a good view of rocket scientist at work. Did you manage to figure out what Flapper had figured out? If I did not recall wrongly, this was the footage where Nic wanted to capture the boys swimming across the pool and then get underwater to retrieve the toy. Thus at the start of the vid, Flaps was swimming towards where the toy was. First thing he did, he dipped his head in to see where the toy was and tried to 'paw' the toy twice before realizing the positioning was wrong. Then he quickly turned himself around before attempting to get the toy towards him. What was interesting (for me at least) was watching how carefully calculated and visually-reliant Flapper's moves were. He would dip his head into the water, determine the position of the toy and by that point, he had already figured out the amount of pressure required to skillfully maneuver the toy with his paw (trust me, that toy moves out of position very easily) to pull it closer towards him, towards the shallow end of the pool. 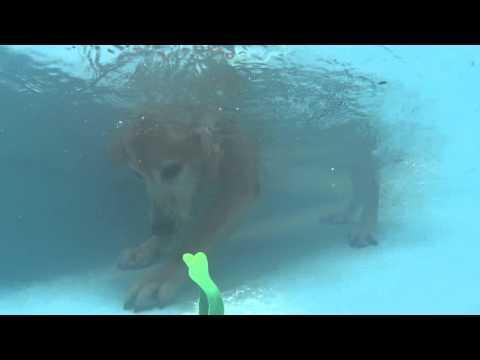 At the last bit, you can see that he, once again, paused to think whether the depth of the water was shallow enough for him to retrieve the toy. Then he decided to maneuver the toy one last time before confidently plunging his head to swoop it up. That is Flapper the Rocket Scientist. I don't think I will have 'Flapper the diving dog' any time soon but I am sure if there is a mensa for dogs, surely he would qualify for it. Then of course, there is Frodo and I know his ardent fans will be all, "what about Frodo?" Haven't you figured out by now that the Derp's videos and stories will make it up to his own 'Doh-AH!' wall of fame? So while I have to get the Derp to prepare his own article, here is the video from the swim.